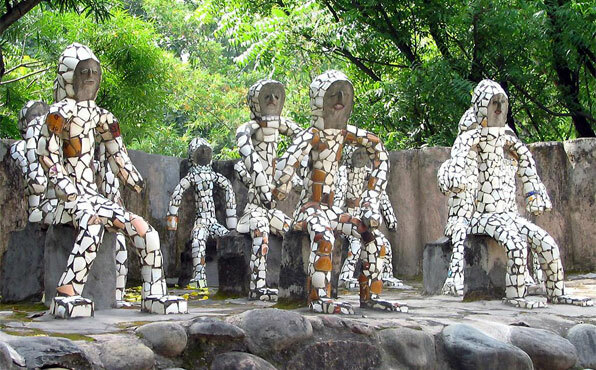 The Rock Garden is a sculpture garden in Chandigarh, India, also known as Nek Chand’s Rock Garden, after its founder, Nek Chand, a government official who started the garden secretly in his spare time in 1957. Today it is spread over an area of forty-acre, it is completely built of industrial & home waste and thrown-away items. While graffiti artists boast over colorful pieces dashed off in the night, they have nothing on Nek Chand, a humble transport official. Working illegally and in secret for over 18 years, Nek Chand created a gigantic 12 acre series of palaces, pavilions, courtyards all filled with his unique rock sculptures. He began to clear a little patch of jungle to make himself a small garden area. He set stones around the little clearing and before long had sculpted a few figures recycled from materials he found at hand. In 1975, when authorities in Chandigarh found the astounding creation in the heart of a nature conserve, they were flabbergasted. The entire complex came very close to being destroyed, but after the public began visiting the site and an agricultural scientist spoke out about the value of this “enchanted kingdom” the garden was saved. When they did discover the garden, local government officials were thrown into turmoil. The creation was completely illegal – a development in a forbidden area. However, rather than demolishing the garden, they decided to give Nek Chand a salary so that he could concentrate full-time on his work, plus a workforce of fifty labourers. The Shatabdi Express runs two or three times daily from New Delhi to Chandigarh. The journey lasts approximately three hours. The Rock Garden is situated in the north of Chandigarh, Sector 1, and is known by everyone in the city. Located in Sector 1, the Sukhna Lake is an artificial reservoir. A popular place to hang out, one can expect to find residents of the city jogging or strolling along the banks. There is a walking path, a cafeteria, shops and a mini-amusement park and paddleboats. The Sukhna Lake was created in 1958 by damming the Sukhna Choe, a seasonal stream that flows down from the Shivaliks. Storks and cranes make migratory stops at the lake. The lake, incidentally, has Asia’s longest water channel for rowing and yachting. The city houses the largest rose garden in Asia. It also hosts annual rose festival which is quite popular among local population. Most of the capitol complex is fenced off due to tight security, the open hand is accessible and from there you can see the main buildings, albeit in the distance. If you want a closer look at the Capitol, you need permission from the Tourist Bureau, in the ‘Deluxe Administration building’ in Sector 9. Please note the capitol and bureau are only open on M-F. The tourist bureau is not well signed, you’ll need to ask. It’s in the single story building out the back. Bring your passport and prepare for the beginning of the most amazing experience in Indian bureaucracy. All in all I spent three hours in total of which 50 minutes was spent looking at architecture. The tourist bureau gives you three letters giving you permission to visit the three main buildings of the Capitol complex, The Secretariat, the High Court and the Assembly. The letter is fine for looking around the High Court just show to security at the entrance, around the back, but if you want to take photos you need to surrender your camera, and head in to fill out some more forms in the protocol office, and the take the forms back to security to get your camera back. It’s worth it as the building is amazing, and extremely photogenic. You can’t take any photos indoors. To check out the Secretariat, it’s a little harder. First you need to find ‘reception’, which is just a small building out the back and show them your letter to get a visitor permit, then you need to see security who will let you in, then you need to see the main security officer inside, who will send you up to the registrar who will then send you back to the main security office. Thankfully you are escorted through most of this confusing, overly complex procedure, usually by a junior soldier with large machine gun. Whole process takes about 30 min. to an hour. Once it’s all clear you can go up to the roof, check out the geranium gardens, and take in an expansive view of all of Chandigarh. Then they’ll let you have a look out the front, which is more interesting. Ran out of time, so make sure you have a whole clear weekday to appreciate all the capitol buildings. Also called Yadavindra Gardens are 20 km (12 mi) from Chandigarh, 15 km (9 mi) from Panchkula, on the Chandigarh Shimla road. Taxis and buses ply regularly between Pinjore and Chandigarh. Pinjore lies on the foothills of the lower Shivalik ranges. The fascinating Mughal Gardens one of the most popular picnic spots. A mini zoo, plants nursery, a Japanese garden, historic palaces and picnic lawns await tourists. Located in Sector 11, the museum and the combined art gallery is an interesting place to go to. Artifacts range form the Harrapan Period relics to the paintings and coins from different areas and time periods. Fossils of the local dinosaurs found in the region. The Chandigarh Museum, which is just next door, provides an interesting aspect on how Chandigarh was founded. It begins with the principles on which Chandigarh was built, selection of the Architects, the design for the people etc.